Two-time SUNY New Paltz graduate Samrat Pathania ’13 (Mathematics; Adolescence Education – Physics) ’18g (Adolescence Education – Mathematics) has been awarded a pair of prestigious awards aimed at helping scholars as they make the transition into STEM education. Pathania, currently a teacher at Wallkill Senior High School in Wallkill, New York, has been named the sole winner of the 2017 STEM Teacher Scholarship from the Congressional Medal of Honor Foundation, and was also awarded one of two 2017 Mathematics Graduate Course Work Scholarships from the National Council of Teachers of Mathematics. Pathania’s career began in information technology. He studied engineering in Jamshedpur, in his home nation of India, and worked in Bangalore as a software programmer before coming to the United States and accepting an IT position in Long Island. Shortly thereafter, Pathania opted for a career change and enrolled at SUNY New Paltz, where he studied physics education and mathematics, and first met Professor (now Emeritus Professor) David Clark. When they began working together, Clark had just published a new textbook, “Euclidean Geometry: A Guided Inquiry Approach,” which was aimed at helping high school mathematics teachers adopt new pedagogical approaches in the wake of generational changes to best practices in teaching mathematics. “At that time I was interested in developing the theoretical foundations of this new geometry to support university instructors teaching from the book, and was looking for a capable and interested collaborator,” Clark said. 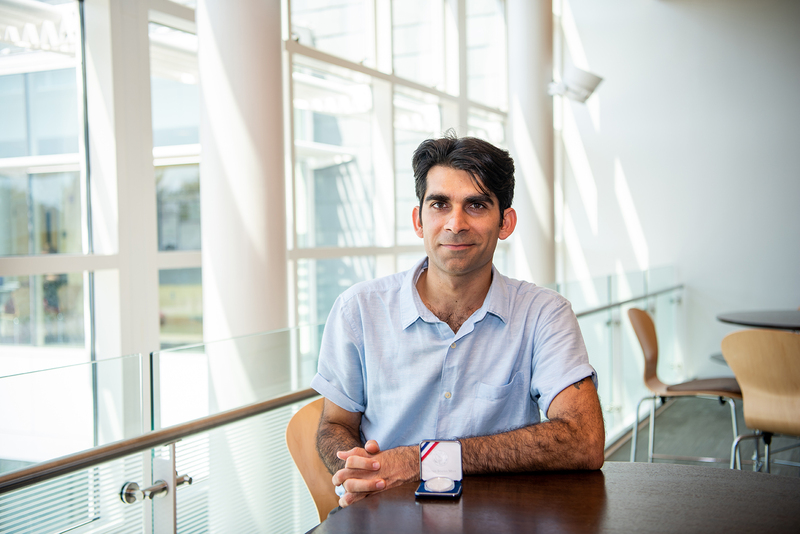 Pathania continued his education and his collaboration with Clark as a graduate student, this time focusing fully on mathematics. He graduated again in May 2018, and has kept on with Clark in the months since. The two awards recognize Pathania’s work both as a scholar and for his work designing and teaching courses at Wallkill High School. He says in many ways the two roles go hand-in-hand – he remains dedicated to his work as an educator, but also credits the research experience with Clark as foundational to his appreciation of mathematics and teaching. “Even after completing my engineering in India and working for many years as a software programmer, I saw mathematics merely as tool to be used in the pursuit of science,” he said. “I had no clue as to how creative and in some ways transcendental the field of mathematics is. Visit the Department of Mathematics and the Department of Teaching & Learning to learn more about opportunities available at SUNY New Paltz to students of math and education.